Only four more weeks to go until the release of Super Smash Bros. on the Nintendo 3DS, and Nintendo is celebrating with an entire month of sales! 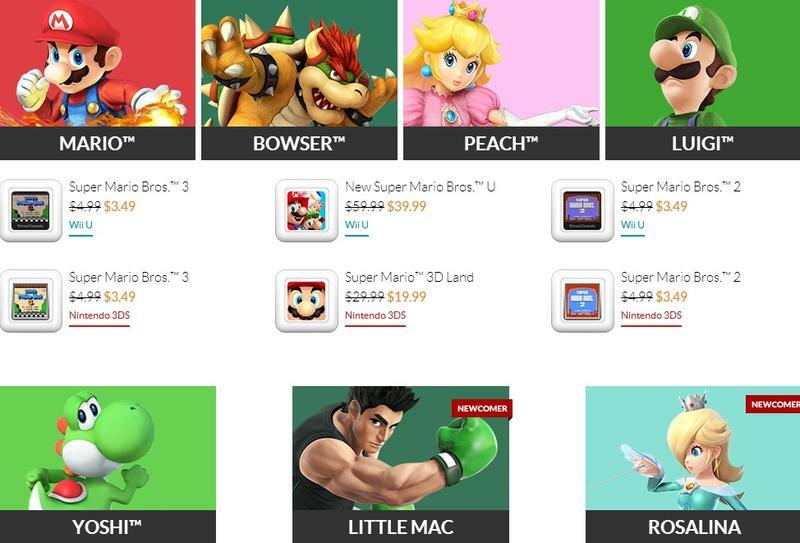 For each week until the game is released, you'll be able to buy games starring Smash Bros. fighters for 33 percent off the normal price. Kicking off this first are a quad of Nintendo's most recognizable characters, Mario and friends! Mario, Peach, Luigi, and Bowser's selection of games include Super Mario Bros. 2 and Super Mario Bros. 3 for both the Nintendo 3DS and Wii U Virtual Consoles for $3.49 each. The Wii U's New Super Mario Bros. U is also up for sale at $39.99, and my favorite modern Mario game, Super Mario 3D Land, joins it for just $19.99. Yoshi's choice is Yoshi's New Island at $29.99, a price only I feel might be worth it. Seriously, nobody else in the entire world likes this game. Rosalina also has Super Mario 3D World to her name, and it is for sale at $39.99. I guess they still can't sell Wii games through the digital channels or Super Mario Galaxy would be a better choice for her. And we have the odd man out. He doesn't star in any Mario games, but Little Mac has the same unique distinction as Mario and Donkey Kong by getting his roots from the classic arcade scene rather than the home consoles. You can snag Punch Out! Featuring Mr. Dream for $3.49 on the Nintendo 3DS and Wii U console. Week 2 promises to be only bigger with Link and the Legend of Zelda crew, Marth and the Fire Emblem crew, Pit and Palutena from Kid Icarus, Captain Falcon from F-Zero, Mega Man, and Sonic. Week three stars the playable Pokemon fighters, Samus from Metroid, and the Wii Fit Trainer and Mii Fighters. Week 4 closes out with Donkey Kong and Diddy Kong, Kirby and King Dedede, Pikmin's Captain Olimar, Star Fox, Pac Man, and the Animal Crossing Villager. Whew, so much saving! The games I would like to pick up this first week are Punch Out! and Super Mario 3D Land, since I don't own it digitally, but I'm going to wait for next week to see what kind of Zelda and Mega Man savings I can snag. You never know either! Maybe Ness will be announced by the time this sale finishes, and Earthbound could even go on sale!